Shelley Says: Water, Water Everywhere and I Need Filters! Water, Water Everywhere and I Need Filters! 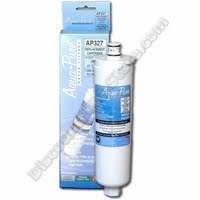 Here's a question you don't get asked everyday: how many of you need water filters? I need more than I would like, but since that is the case, I wanted to find somewhere to buy them at prices which would make a whole lot of sense. I need filters for my refrigerator's ice cube maker and air filtration system, for my whole house water and for my sprinkler system. Each should get changed at least every 6 months or less, depending on water use. I searched and searched. I can't tell you how long it took before I came across this site and finally said, "Hurray!" Their slogan is, "Spend less, get more...DiscountFilterStore!" Not only that, they arrived only a few days after I placed the order. Well done, especially since I had not changed my ice cube maker's filter in quite a while. Here's to clean water everywhere! Who Wouldn't Want Free Medical Advice? Napping - Why We Should Try It!